Is your small business connected? Whether you’re just starting up or you’ve been in business for a while, if you have an office, employees and computers you use every day for your business, you should have a computer network. For small businesses in today’s fast-moving commercial environment, a good computer network is necessary. Why Set up an Office Computer Network? Possibly the greatest advantage of a computer network for your business is what it does to your ability to manage workflow. When your employees are all linked to a computer network, any employees you need to can access any files or data on the system at any time. There is no need to email files, save files onto a flash drive or use any other method of file transfer. This can be a huge time saver. Everyone knows where all of your digital files are located, so there is no extraneous communication. You can also see exactly who made changes to a file, what changes they made and when, making it easy to answer any questions about a file or data without any extensive logistics. If you’re a small office, you don’t need any extra expenses. When you are connected to a local computer network, all computers in the office can work with a single printer, scanner or other peripheral. No need to pay for dedicated office computer equipment for every employee. You can also have all employees riding the same internet connection, so there’s no need to pay multiple internet access bills, and you can upgrade the whole company’s internet at once. Employees don’t need to email each other or find other ways to connect through public internet. You can arrange it so that your people can message each other electronically through your company’s internal intranet. Office software can be expensive. Rather than having to shell out for a usage license for every computer in your office, you may be able to buy a single business license for one connected computer that all the other computers in the network can access. More and more offices, especially for small businesses and startups, are moving away from rows of cubicles and more toward an open floor plan. Implementing this kind of model is much easier when your team is connected through a local computer network because employees do not need to be at one set workstation to access computer files. Every computer on the network is essentially the same as far as retrieving files and data. If you have a small business in and around the research triangle area and you’re ready to make the move to a dedicated local computer network, Intellicom, Inc. can help. Contact us for information on communications infrastructure and other local network solutions today. Solar Power for Businesses | Intellicom, Inc.
Should your business go solar? While to some, solar may seem like the wave of the future, others may be afraid it is a passing fad or a waste of money. Others may think solar is more appropriate for a residence, rather than a company. The truth is that there are many benefits of solar power for businesses and those benefits are only growing. 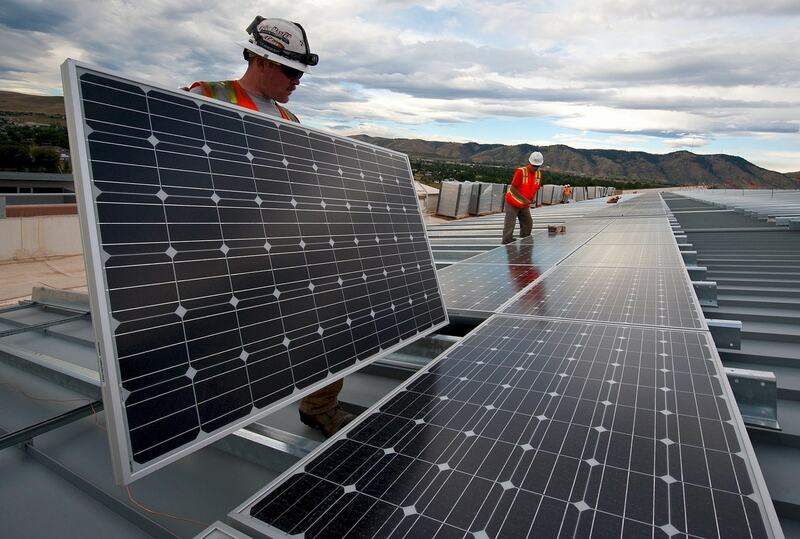 Here are five great reasons to use solar energy for business. Today’s generation is more focused on protecting the environment than ever before, and with good reason. Issues of climate change, deforestation, pollution and other environmental issues dominate the news. When potential partners and customers see that you are a solar business, they know you are aware of the effect industry has on the environment and are taking steps to mitigate your own footprint, which can be very good for your image. Today's solar panels are not clunky metal squares awkwardly adhered to your roof. Modern solar arrays are streamlined, sophisticated and can actually make your physical property look much more state-of-the-art and updated. You probably understand that solar panels can save you on electricity costs, but you may not understand just how much it can save you. If you have a net metering contract with your power company, that means you take as much energy as you can or need from the sun. You get the rest from the power grid. However, if you’re getting more energy than you need, you feed it into the power grid for credits, which can come in handy at times of heavy electricity use for your business, especially as electricity prices rise. In addition to all of this, your state may offer tax credits or other incentives for adding a solar array to your business. While you may not be looking to sell your physical business property anytime soon, studies show that adding a quality solar array can noticeably raise your property values, earning you a better price if you do decide to sell for a relocation or expansion. Solar panels are very easy to install on your business roof, and you can install as many or as few as you need to. You can start by adding a small array to a small section of the roof, and if you like the results and want to try to do more, expand to more solar panels. It’s entirely in your hands. Intellicom, Inc., famous for its security and telecommunication solutions, also provides solar technology solutions for businesses in the Durham, North Carolina area. We have the experience and technical expertise to help you design and implement the ideal solar energy solution for your business. For more information on enhancing your North Carolina business with the benefits of solar energy, contact us today. Surveillance camera placement is a critical issue for businesses, along with surveillance camera set-up. Where and how you place your cameras is a huge factor in the effectiveness of your system. If you do not know how to position surveillance cameras, you could miss critical areas of coverage. If there are blind spots, you can be sure criminals will find them. 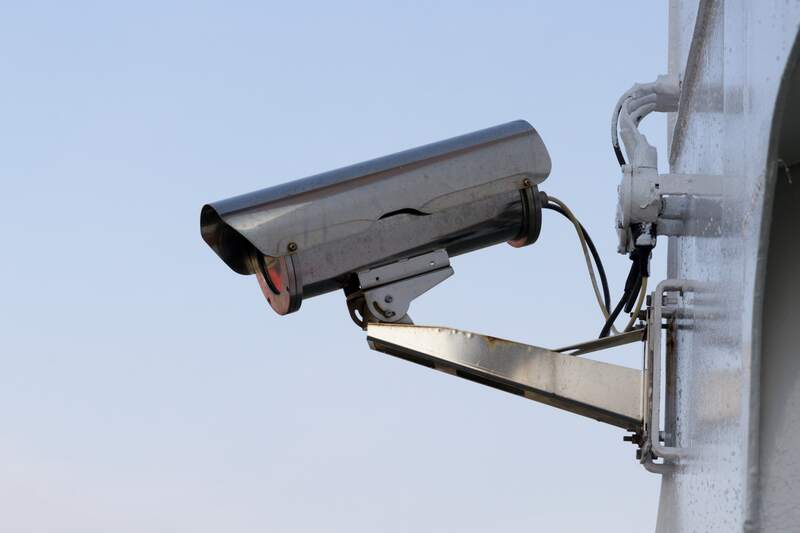 Here’s what you need to know about where to place surveillance systems. Deterrence: Ideally, a potential thief or industrial saboteur will see your cameras, know they’re being watched, and walk away, just as if there were a security guard standing right in front of them. For this to work, however, the security cameras must be visible. Investigation: If an intruder does try to break in or steal something, you want your surveillance cameras to spot them, either so you can alert the police immediately with real time monitoring, or so you can capture the thief’s image and know what they did and when they did it to make it easier to apprehend them later. Both goals require your security cameras’ field of vision to be as complete as possible. Entrances and Exits: These may be the first points of entry intruders target, plus it’s the best place to get quality images. Customer Transaction Points: If your office is consumer-facing, anywhere there are cash registers, teller stations or places where valuables or money are exchanged should have a security camera in sight and facing the spot where the transactions take place. Valuable Targets: Any location in your facility where you keep valuables — whether that’s classified documents, a bank of expensive computers, jewelry or anything else — should be guarded by a wide view security camera to capture any robbery attempt in its entirety. Parking Lots: Parking lots, as well as darkened alleys or other secluded areas on your property, are difficult to defend, and criminals know this. Well-placed, visible security cameras can let them know that you’re watching and guarding these areas. Even now that you know the best spots to install your security cameras, you shouldn’t try to connect them yourself. Professional surveillance camera experts can make sure the cameras are not only in the right places, but that they’re positioned correctly to capture what they are supposed to. To have your business surveillance cameras set up and installed correctly in the North Carolina area, as well as with real-time monitoring and other protective features, contact Intellicom today. The digital technology revolution has modernized virtually every aspect of our daily lives, and one of the most important places where it has made a difference is in the classroom. Today’s best college classroom technology is the “smart classroom,” a teaching space with the ability to accommodate interactive digital technology for the benefits of students and instructors alike. Many colleges are rooted in tradition and slow to change, but it’s hard to deny the accelerated effect on learning that modern smart classrooms can offer to students. Here are four key features of a smart classroom. The individual desk or seated auditorium is becoming a thing of the past when it comes to college lectures and seminars. Today’s college students can benefit from collaborative furniture, which facilitates multiple students working together. These stations also maintain the ability to switch to individualized learning configurations, as well. Of course, such furniture must also be enabled for laptops or other digital devices as needed. A smart lectern gives the educator a digital command center. It can include USB ports, smartboard controls, a flat-screen monitor and audio/visual capabilities. It’s everything a teacher needs to easily communicate ideas to the class. There is no excuse for not having multiple power outlets in today’s classrooms. It should be expected that both teachers and students may have devices that need to be plugged in. You don’t want to have to stop class every time someone’s battery runs out. And when it comes to lighting, a brightly lit classroom is no longer the standard. If you’re projecting information on a smartboard or flat screen, lower lighting is optimal. 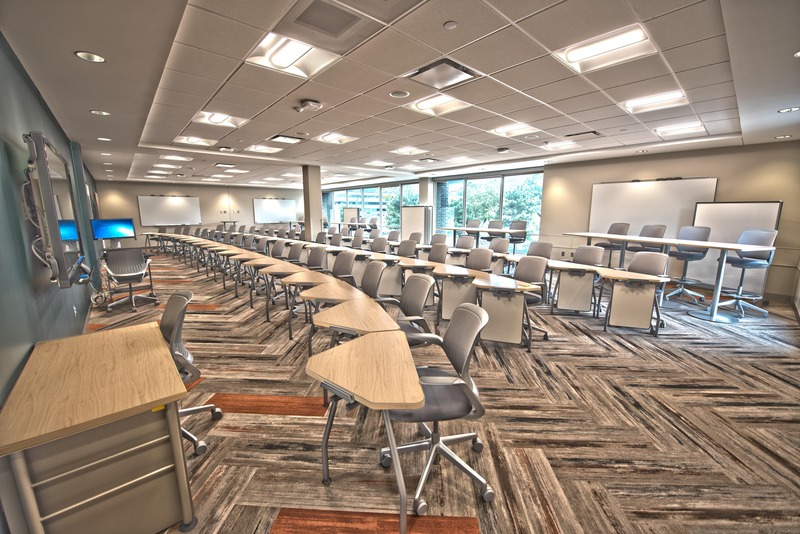 Today’s modern classrooms must have adjustable lighting that can be dimmed or enhanced depending upon the situation. The days of blackboards and chalk dust will soon be over — if they aren’t already — and good riddance to them. An interactive white board is one of the best ways to communicate ideas to students. These brilliant, touch-sensitive devices allow you to project any subject on the surface with your computer, then interact directly with it using your finger, a pen or a stylus — and all without getting chalk on your fingers. In North Carolina, the place to go for wireless collaborative display solutions like smartboards for classrooms is Intellicom. We can set up advanced collaboration tools to enhance your ability to communicate and interact with your group, whether the situation is a college learning environment or a business conference. Intellicom has more than 25 years of meeting support and telecommunications experience under our belts, and 100 percent customer satisfaction. If you need help taking your classroom or other collaborative learning environment to the next level, contact Intellicom for a free quote on our services, or give us a call at 919-980-4295 to discuss digital collaborative learning solutions today.